If you asked someone what linked the tropical Hawaiian island of Maui and the South-Central Mexican state of Morelos, chances are you would get rather more peculiar looks than you would get answers. For the vast majority of people, there is no link between them. For avid lower-level tennis fans, they might mention that both play host to an event on the Challenger Tour. However, for one particular player, the two tournaments might be somewhat more memorable. That player is the current world #128, Jimmy Wang. 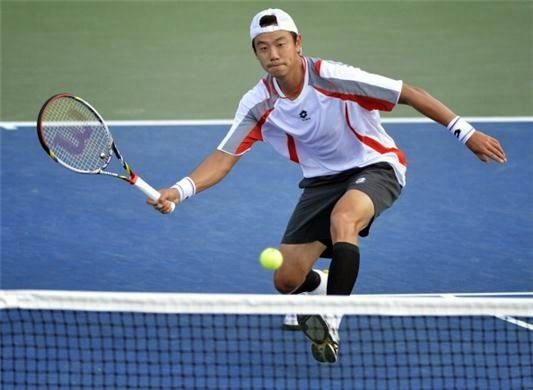 A former junior number three and finalist at both the Australian Open and US Open junior tournaments, the Taiwanese number two has career earnings of a fraction over $1,000,000 in a career stretching back almost fifteen years. However, in both Maui and Morelos, there have been major concerns surrounding highly suspicious betting patterns on his matches. Whilst the two matches are both highly suspicious, the actual nature of the potential fix is different in the two cases and it provides an interesting insight as to different ways of profiting from a potentially fixed match and possibly as to the progressing of the style of fixing. The first match I will look at was played back on the 22nd January, 2014 from the Hawaiian island of Maui. The match saw Jimmy Wang, ranked 173 at the time, and having just come off the back of qualifying for the Australian Open playing against one of America’s most talented college players, Jarmere Jenkins, ranked 342, who had only made it into the main draw as a lucky loser having lost in qualifying. At 7:11am in the UK, Pinnacle had opened up the match for betting with Jimmy Wang as the 1.50 favourite and Jarmere Jenkins at 2.64. In other words, Jimmy Wang had been given a 66.7% chance of winning the match with Jenkins being given a 37.9% chance. A potentially close match, but one in which Jimmy Wang was certainly rated as the favourite. By 8:00pm when the match was taken down, there had been a strong shift in the odds. 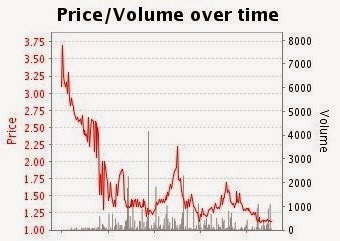 Jimmy Wang’s odds had drifted way out to 3.00, while Jarmere Jenkins was now the 1.40 favourite. Having had a 66.7% chance of winning the match in the morning, Jimmy Wang’s chances were now down to 33.3% while Jarmere Jenkins was now 71.4% to win the match. The initial odds may well have been slightly wrong – American college players are often underrated by the market – but it seems unlikely that the odds were that wrong. Looking at the Betfair historical data for that match also raises several flags. Across the four markets that Betfair offers (Match Winner, Set Betting, Set 1 Winner and Set 2 Winner), there was £19,625.61 matched. The majority of Challenger matches would expect to see up to around £2,000 matched. The table below was compiled for a different article, but represents the amounts matched pre-match on first round matches from the Tampere Challenger last year. As we can see, the amount matched on this Wang Jenkins match is unusually high. Almost £14,000 of this was matched on Jarmere Jenkins in the match winner market at odds ranging from 2.84 down to 1.31. Interestingly, there were only 163 individual bets matched to cover all of that money, suggesting that fairly large amounts were being staked in individual bets. 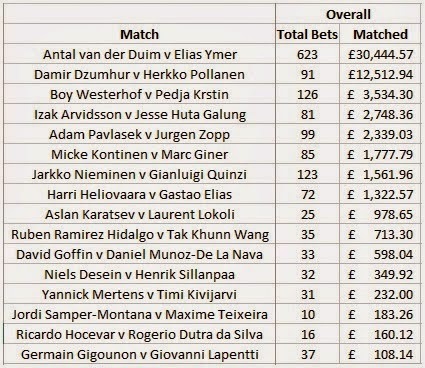 During the actual match itself, Jarmere Jenkins was never matched above 1.83 and over £65,000 was matched on Jarmere Jenkins with less than £5,000 being matched on Jimmy Wang. Jimmy Wang never created a break point in the match and was able to win just 11 points on the Jenkins serve throughout the entire match. Could it be that there was nothing suspicious and Jarmere Jenkins was simply a deserving favourite? As one of America’s top college players, maybe he did have the potential to be a top player and someone simply recognised that and decided to back up their views with a large amount of money. Possible, although the fact that a year on, Jarmere Jenkins is still ranked at 191 suggests that maybe that is rather unlikely. 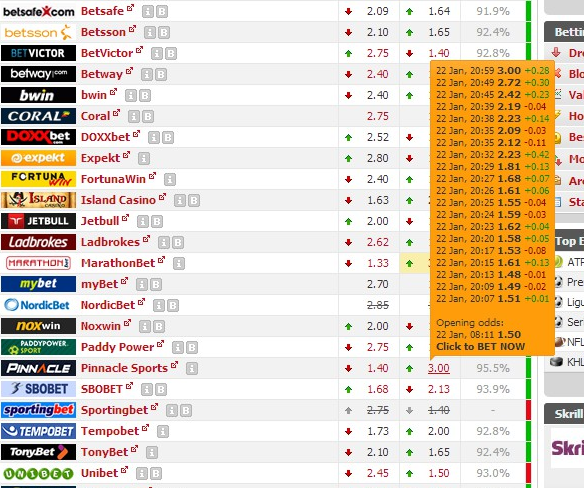 It is noticeable here that there was a huge amount staked pre-match causing big moves in the odds. While there was a reasonable amount matched in-running, big money was put down before the event. Jumping forward to today, Jimmy Wang was once again in action. This time, the location was the city of Cuernavaca in the Mexican state of Morelos. The opponent was Giovanni Lapentti, a former world #110 and a career journeyman on the Challenger Tour. At 7:16am this morning, the Pinnacle odds on Giovanni Lapentti to win the match were 2.85 with Jimmy Wang at 1.43. In other words, Jimmy Wang had a 69.9% chance of winning the match and Lapentti had a 35.1% chance. Throughout most of the day, there was little movement in the odds. However, there was a very peculiar movement at 3:57pm, just three minutes before the match was scheduled to begin. In one single move, the odds on Giovanni Lapentti were slashed from 2.72 into 1.99 – a change from a 36.8% chance to a 50.3% chance. While it takes less money to move a Challenger market with Pinnacle than an ATP market, it would still have required a large sum to move it that much in one single jump. By 4:00pm, it had moved back out to 2.35 presumably as traders and bots recognised an incorrect price and moved it back out to a more realistic price. In itself, that is not a massive red flag. It is unusual to get a move of that magnitude, but there are big punters out there on tennis. However, the betting patterns during the match itself add weight to our suspicions. 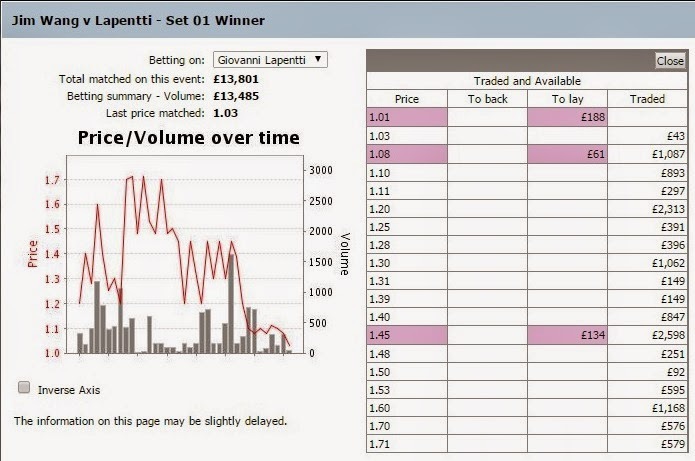 There was also an interesting plunge in the odds on Giovanni Lapentti on Betfair in the run-up to the match. The volume bars at the bottom give us an idea when the match started - there is generally a pick-up of volume once a match actually begins. We can see that from a peak of almost 3.75, Giovanni Lapentti shortened significantly to around 2.25, before a huge drop following an early break of serve. Despite Wang breaking back and actually going ahead a break, we can see that Lapentti barely even returned back to his pre-match price, even whilst a break down in the first set. 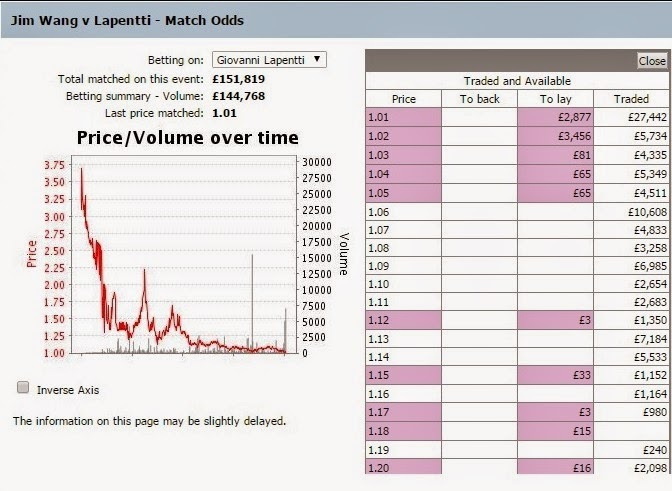 As we can see, at 5-5, *15-30, Giovanni Lapentti is now the 1.22 favourite to win the match and 1.03 to win the first set. This is pretty unlikely given the starting prices in the match. Even if we take the starting Pinnacle odds, which had already been moved by the large bet on Lapentti, Jimmy Wang was 1.61 to win the match at the start. It seems unlikely under any situation that he would now be 5.0 to win the match - a move from 62.1% to 20.0% - simply from being 15-30 down on his serve at 5-5. One might be able to make a case had Wang gone well ahead in the match before Lapentti made a dramatic comeback. While Jimmy Wang had been 4-2 ahead, the previous three games had all been holds of serve, so there was no major momentum effects at play. Jimmy Wang was broken in this game and Lapentti served out the set. Another flag here was the amount that was matched on Giovanni Lapentti to win the first set. The set winner markets are generally pretty low liquidity on Betfair, so to see almost £14,000 matched on the market with the vast majority on Lapentti is concerning, especially with reasonable large amounts matched between 1.40 and 1.60. We cannot simply put this down to money buyers inflating the matched figure at short odds. At the end of the first set, Giovanni Lapentti was into 1.10 to win the match. The same possible reasons for this price apply here as it did in the Denys Molchanov match (as explained here). Realistically, the only possible reason for a price like this given the circumstances was an imminent retirement through injury. There had been no signs of an injury at this stage, although Wang did call a medical timeout at 0-1* down in the second set. By this point, the market was fully convinced that Lapentti would go on to win and there was virtually no move at Wang getting a break back at 3-0 down. By the end of the match, there was £151,819 matched on the match winner market with the vast majority of Giovanni Lapentti. Again, is there definite proof that the match was fixed? No. Are there strong suspicions surrounding the questionable betting patterns on this match? Absolutely. Maybe Wang was ill or more injured than he let on. If this was the case, then while the match may not have been fixed, someone was certainly passed the information before the match had started. Each of these two matches showed suspicious odds movements that corresponded with the actual outcome of the match. On their own, they would both have raised red flags. Taken as a pair involving the same player, serious questions must be asked. Whether those questions will be asked remain to be seen. There was a decent response from tennis journalists on Twitter in the wake of the suspicious betting patterns on the Molchanov match. However, if the ATP and TIU are not going to show any indications that they intend to seriously tackle the problem of match fixing, it is down to these journalists to ask the difficult questions. There are people such as myself and many others on Twitter who pay close attention and trade these markets and are very capable of spotting suspicious betting patterns. However, we do not have access to players and officials to ask questions and too many times, we are fobbed off by claims that we have lost bets and are simply bitter and looking for excuses. Alternatively, people simply suggest that betting should be stopped on lower levels of tennis. Put simply, this is just not going to happen. It is a lazy suggestion and does nothing to tackle the problem of match-fixing - betting would still happen on these events, but it would just be forced into the illegal markets where it would be impossible to track. Instead, the authorities need to target those players and associates that are involved in match fixing. And if the authorities are not going to do it, it needs journalists to question those in authority. We saw in cycling how it was journalists that eventually blew the lid on the Lance Armstrong doping situation. Is there a serious respected tennis journalist that is willing to ask the right questions to the right people? Surely the big punters can make huge profit if they move the markets by that much, all they have to do is lay on betfair after price fall?